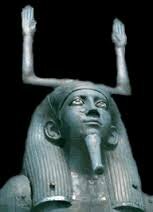 In Ancient Egypt, Kemet, magickal or meaningful speech was called "heka". This is the "Art of the Mouth". 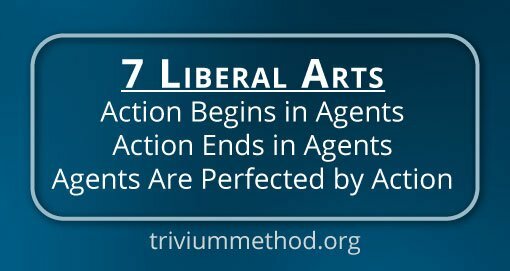 If you're familiar with the Trivium Method, the aspect of Rhetoric is the Art of Communication. 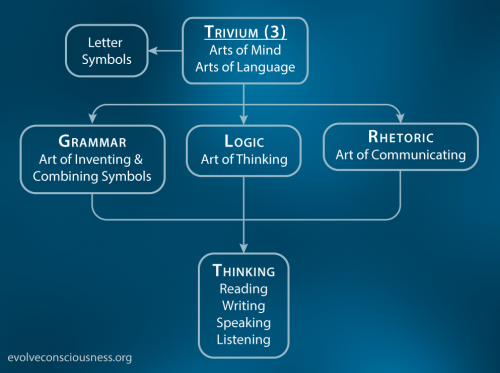 This 3rd phase in the trinity is also representative of Wisdom, Output and Action, the culmination of the other two aspects of the trinity, Knowledge-Input-Grammar and Understanding-Processing-Logic. Why was speech and the mouth used? Heka was a foundational concept (like maat) in Kemetian creation mythopoetic narratives to represent the importance that speech and rhetoric have to change and alter the world around us through the influence and affect that word symbols have on consciousness. Heka was externalized, personified, anthropomorphized, reified and deified as a "god" to represent this idea. The symbolic mythopoetic creation mythology analogized this through the power of speech in creating all the other "gods" that represented different understandings of aspects of reality and consciousness qualities. Heka permeated everything in creation, since it was all created through the art of mouth, meaningful speech, magic. 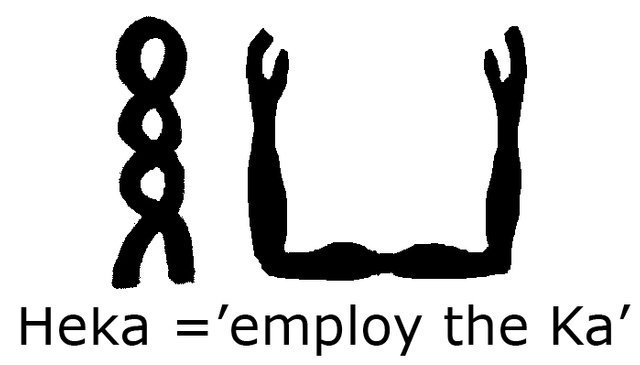 Heka is he-ka, and the word "he"was the symbol of entwined loops to symbolize time, infinity, and eternity, used to represent millions of years in some cases. But it had a more important meaning when used with the all-powerful symbol "ka". Ka was used to symbolize Power, Energy, "Spirit", Life. 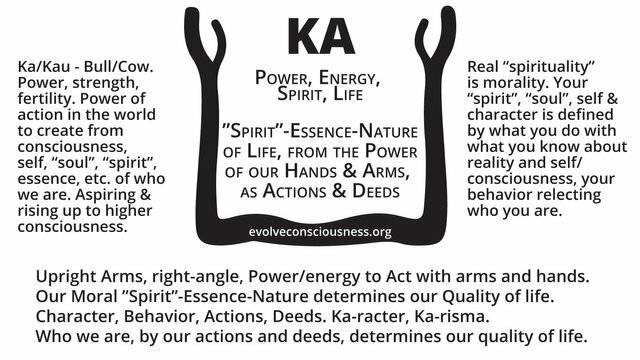 Ka is our Moral Essence, the "Spirit"-Essence-Nature of Life Potential we can exemplify/embody, from the power of our hands & arms, as actions & deeds. Know-thyself. Ka-racter, ka-risma, who we are, our character, behavior, actions and deeds, determines our quality of life. This is a moral potential to continually evolve consciousness into higher, realer, truer, more authentic versions of ourselves. Heka is to employ, use or engage in the power or energy within us, the power of our consciousness, psyche, "soul", "spirit", and conscience of our moral nature and moral essence that determines the quality and condition of our lives. Moral Truth was the other all-pervading foundational concept of Ancient Kemet, called maat, or personified as the "goddess" Maat. Heka symbolizes our actions through cyclic time, as in the Wheel of Dharma, Karma, Time, Fortune, Fate, Destiny, boundaries of behavior for living. We reap what we sow. We create our own destiny, fate and fortune through time. Much of what makes things flow in our human created world and reality, are our actions. Words and speech are especially powerful to influence, affect, and potentially manipulate consciousness to act and behave in certain ways of living to create the way of life we lead. There are many ideas that are sold where people buy into them and live accordingly. These are spells, invocations, conjurings, that are injected into consciousness through the simplicity of being heard and listened to. This is magic of the highest kind, imperceptible, hidden, mysterious, unless you know how to see and hear what is being done to you. 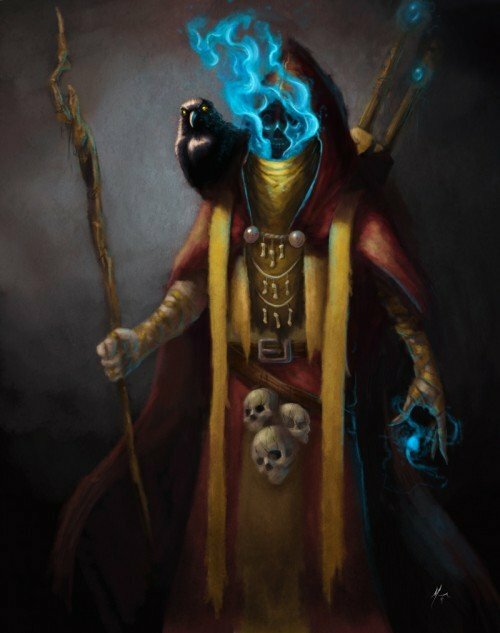 Heka is a magical power potential in all higher consciousness beings that can use the art of mouth to influence others. 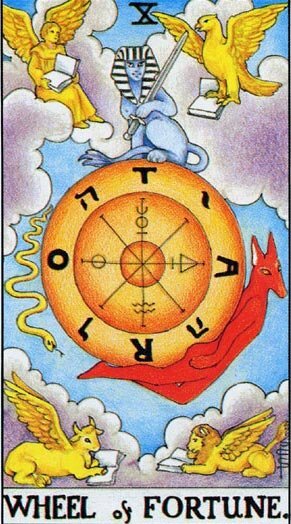 This power is also represented through "ka", the power/strength potential of our actions to output into the world, which includes our speech/rhetoric. Everyone is a potential "magician" or "wiazrd" with the power to act upon reality in a positive way to influence others. The positive is representative of what is right, good and true, the symbolic "Higher Will", the higher, realer, truer self potential (a.k.a. "Higher Self" symbolic externalized imagined belief), of using our will-power and actions based in understanding and living in the Moral Truth. When used incorrectly in a negative way, to bend other people's will to your own will with manipulation, lies, deceit and falsity, would make you a "sorcerer" instead. 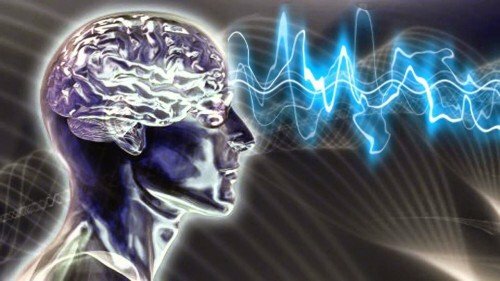 "The power of words which have conscious (or unconscious) meaning, when spoken or chanted aloud, have an ecstatic quality which may bring one into a hypnotic or meditative state." 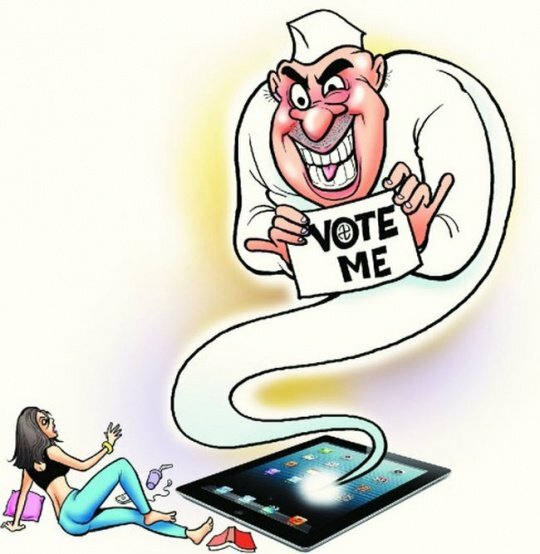 Chanting, entertain, amuse, amaze, mesmerize, hypnotize. 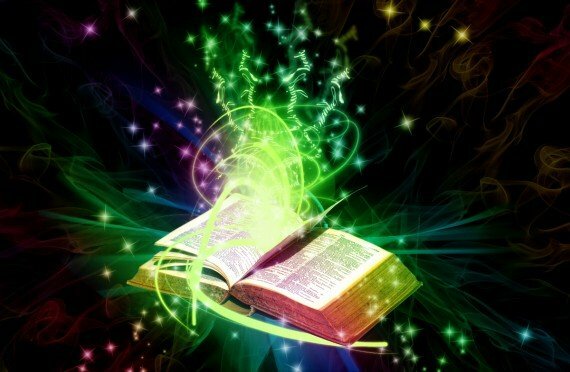 These are altered states of consciousness that can be induced, invoked, and summoned into consciousness, just as a magic spell in fictional stories can summon things into reality, these spells cast on the mind will often summon specific actions and behaviors into the world (government is one example, a belief cast on consciousness to live a certain way in life). The magic of word symbols, "magical phrases" or buzz words, can be used as opiates to fearful masses. Make people feel-good, love-bomb them, and you can more easily gain their trust, loyalty, faith and belief in you as someone to listen to and follow in life. "Spiritual" gurus have this effect on people, whether intended or not. This is what politicians do with their sophistry and rhetoric to lie and manipulate people's consciousness into certain behaviors. The entertainment industry, television, "gurus", politicians, priests, and more, can all amaze, mesmerize, hypnotize, induce, summon and invoke beliefs and altered states of consciousness to entrain us into specific modalities of living. Magic understood this way, is not only an art we can use in varying degrees of mastery, but also a science in itself that can be objectively measured by the affect it has on consciousness and the resulting actions that are produced to create, manifest and generate the human world and way of life we have created for ourselves. We can practice and master this art and science to create more good, right and moral truth into the world, and we can also do the opposite and create more evil, wrong and immorality into the world. Understanding principles of moral truth is a supreme importance to determine the condition and quality of life we lead. A magician or wizard is concerned with the suffering of all beings and seeks to alleviate that suffering of all by influencing consciousness to understand the root causal factors of how we create the conditions of suffering for ourselves on this planet. They are not solely concerned with their own suffering, and use their will-power to try to find ways of ending the problems, chaos, immorality, evil, violence, enslavement and suffering in the world by being concerned with and including other beings into a larger scope, worldview and perspective. Caring for ourselves requires also caring for others. 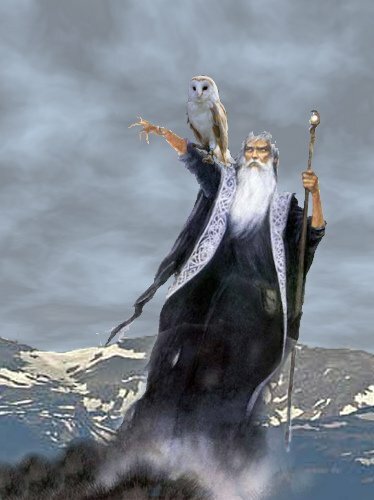 Sorcerers use their will-power to create advantage and gain for themselves or their circle of concern alone, and often at the expense of others because it's about them and theirs; their circle of inclusion of their family, their friends, etc. ; "my truth", "my freedom", "my survival", while they find ways to justify their actions against others because they are not included in their circle of concern and care. We are bound together, connected, in how we collectively aggregate our actions and behaviors in a social context to create the environment that we live in. We can create and have greater freedom, peace, prosperity and anarchy (no rulers, no masters, no slaves), compared to the enslavement, war, scarcity and chaos we are still creating for ourselves on this planet. It all starts in consciousness and ends in action. We are all in this together. Even if we have our own particular geographical zone of comfort and convenience, overall our condition of life on this planet is still in a state of suffering. 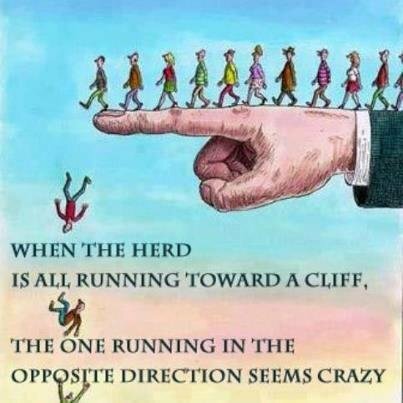 We have to influence others to seek moral understanding to prevent us all from running off the cliff. Magic is influence, affect, induction, etc. Everything you hear and see, from other people speaking, what they do, the media, and everything else in your socio-environmental scope of perception, is affecting you from the day you are born until the day you die, and it all shapes you into who you are and who you become. I like how you explain such interesting topics using the Trivium paradigm. Keep on with those great posts! Thanks. I try to bring quality knowledge and understand on this platform to help us grow in wisdom of right-action. Understanding is key to get things to change. Peace. This was very eye opening. I look forward to learning more about this topic! Thanks for the post. I will be posting more about language, word symbols and reality. Take care. Peace. An eye opening read into the power of the conciousness and the link to magic. Scouring the net to find out more information! Indeed. Most people only think of "magic" as one particular thing. But to understand what it really means from the ancient sources, it is an eye opener into how reality is magic, but not woowoo magic, this real magic of words, language, consciousness and psychology that can be demonstrably understood in an objective manner. They should make "Groups" or "communities" -- Can we tag all of our esoteric teachings with a certain code word so we can search and find all posts specific to our little "group" of people who research this stuff? You could... but I don't focus on whatever "esoteric" may mean to certain people. 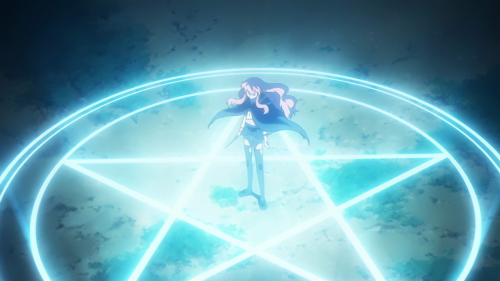 It's just truth, whether it's hidden or not, "occulted" or not, I don't really care to make a tag for it. But feel free to do so. Thanks. Peace. oh my god all this with magic? Really liked the post, you've got a new flower. @krnl! Wo0ot. Hehehe. Please check out my previous work if you run out of things to read. Lots of good stuff already there.